On first blush there might seem to be no point of contact between Romanian sculptor Liviu Mocan’s cracked and sprouting seeds in wood and bronze and British artist Damien Hirst’s tiger shark in formaldehyde and diamond-studded skull.Nevertheless, beneath the differences of media and tone, Mocan and Hirst take us on complementary journeys through the complexities of life and death. The first milestone on this journey, the first sensation that assaults us when we counter Hirst’s shark and skull or Mocan’s seeds, can be summed up by the idea of ‘assertion’. The thirteen-foot shark and the skull laid with eight thousand diamonds completely covering its surface both force themselves on the viewer’s attention, soliciting our gaze across a crowded room as they brashly announce themselves as ‘here’. The shark, in particular, is less something we look at and more something we find ourselves in the presence of, our fascinated eye unable to turn away from its wrinkled skin and gaping mouth. 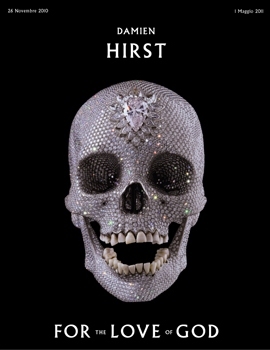 It is, as Hirst commented, ‘real enough to frighten you.’ As for the skull, it announces its presence in each sparkling diamond like a bling-saturated diva of death soaking up the footlights centre stage. The shark and the skull force us into a confrontation with images of death. 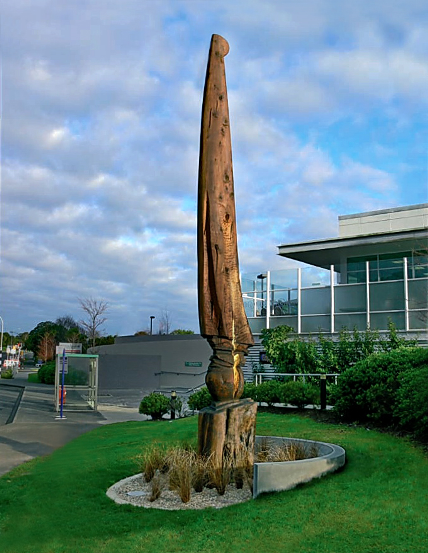 We feel something of the same assault in the presence of Mocan’s Illseed (2007), a seven metre high sprouting seed carved in macrocarpa wood and located outside NorthShoreHospital in Auckland, New Zealand. But with Illseed what announces itself is not death but a splintering, driving insistently vertical affirmation of life. Mocan comments on his seeds project of which this work is part that ‘seeds is the encapsulation of life, seeds is the metaphor for life … the celebration of life.’ Once more, as with Hirst’s shark and skull, Mocan’s sprouting seeds announce this message in their inescapable, attention-grabbing material presence. A common seed is an eminently negligible object that can be held, crushed or eaten, but in Illseed the tiny spherical seed has taken on the proportions and the weight of a cannon ball; the fresh-sprouted stem, usually tender and vulnerable, is presented with all the mass and rugged immobility of a tree-trunk: a solid weight of dense matter. Standing seven metres high, this is not a seed to be trampled underfoot. It is a seed we have to walk round, not over, and a seed that demands from the onlooker a respect for its bulky presence. Both Mocan’s seeds and Hirst’s shark and skull strike the viewer first with an affirmation of their arresting messages of death and life. It soon becomes apparent to the contemplative viewer, however, that behind their hulking, sparkling physical existence there is an absence concealed by these works. A hint of this absence is given in the title of Hirst’s shark: ‘The Physical Impossibility of Death in the Mind of Someone Living.’ The shark is dead and the dead shark is a killer, a bringer of death, but instead of encountering this twofold death directly in the work, what we in fact see is an object for which death has come and gone. As for the skull, that constant even clichéd emblem of death both on the canvas and on the stage, the diamonds that announce its effervescent presence also function as so many mirrors deflecting and dazzling our gaze to prevent us from contemplating death itself. In both cases we encounter the physical impossibility, as Hirst’s title suggests, of contemplating death – not dead objects or representations of death but death itself. After all our experience is by definition conscious experience and death for Hirst is the absence of consciousness. For death to be present would entail being conscious of the unconscious, thinking the absence of all thought, experiencing the void of all experience. I may observe the signs of death in another person and I may experience the cold, creeping approach of death in my own body, but I cannot experience death itself. Death always evades my gaze, always remains deferred and distanced from me, never ‘right here, right now’. With Mocan’s seeds a similar moment of distancing follows the original assertive affirmation. For all their proud, swelling vitality the seed sculptures are not life itself. The movement of a growing, living shoot has been fixed and frozen in the sculpted form, abstracted from its living context and presented in an unnatural fixity. Like the death I cannot directly experience, life as such does not present itself immediately but manifests its effects in the living. Like the spirit/wind which, as Jesus reminds Nicodemus, ‘blows where it wishes and you hear its sound, but you do not know where it comes from or where it goes.’ The Spirit of life is not an object our gaze can dissect but it is experienced through its effects. So what unites Hirst and Mocan at this point in their two journeys is that they both make the gesture of presenting that which cannot be contemplated directly: life for Mocan and death for Hirst. In the same way that when we pay attention to an object, we cannot concurrently pay attention to our attention, life and death here are not themselves susceptible of direct contemplation. Death itself is absent from my experience of the shark or the skull and life itself is absent from my experience of the sprouting seed. But if Hirst’s objects veil the presence of death itself and if Mocan’s sculptures veil an immediate encounter with life itself, this is far from a sign that their respective works have missed the mark. Our everyday existence is full of instances of ‘life’ (our family, our garden, ourselves) and ‘death’ (the food on our plate, the paper on our desk and, for many of us alas, our garden again), but these omnipresent signs almost always fail to register with us their existential weight. We do not see life or death unless it is presented to us as veiled, unless it is arrested in its passing with the trace of its absence thrust before our conscious gaze. It is in the very difference between the presence of the shark and the absence of death that we sense the impossibility to which Hirst alludes. It is in the discrepancy between the frozen vitality of Mocan’s sprouting seeds and the dynamic effulgence of life in the everyday that we sense in a new way the dynamism throbbing in every woodland grove. There is, however, a difference between the absence of death in Hirst and the absence of life in Mocan. Simply to talk of two absences risks painting a distortedly misleading picture of the journeys on which these very different works take us. This is because there is no symmetry between Hirst’s and Mocan’s absences. Death is not absent for Hirst in the same way in which life is absent for Mocan. 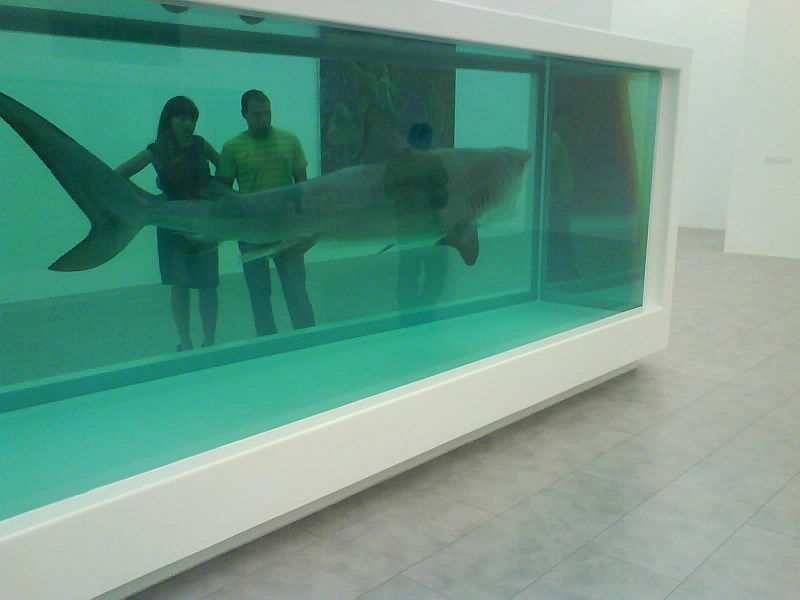 Enrico de Pascale is quite right to suggest that Hirst’s shark yields a residual affirmation of life and that out of the midst of the presentation of death there emerges ‘a way of exalting life by exploring and portraying its opposite’. The lifeless shark frightens us because it conjures in us memories or images of its living, hunting counterpart, and the rapacious vigour of the tiger shark is all the more stark when we are presented with its inert double. This leads us to an important reflection on the relation between life and death as they are presented to us in the works under discussion: we are confronted with life and death not as two equal and opposite forces waging battle or two positive and opposed presences in our universe. Though both life and death as such are absent in these works, in the case of death alone we have a double absence. The death that is absent from the shark and the skull is itself an absence, the negation of life and not a counter-affirmation. After all, what does Hirst assert if not once living things that are now lifeless? Death is not originary but derivative. It can only ever be the second word, not the first, for its absence is contingent on the prior positive affirmation which it negates. This difference between Hirst’s absence of an absence on the one hand and the dynamic of death and resurrection triumph on the other, prevents us from seeing life and death as equal and opposite forces in either Hirst or in Mocan, for both of whom the relation beats out an uneven cadence. In Hirst we hear echoes of the rhythm of creation and fall in Genesis chapters 1-3: first life, then its echo in death, understood as a secondary absence or negation. In Mocan by contrast we hear pounded out the beat not of Genesis 1-3 but 1 Corinthians 15: ‘Christ died… he was raised.’ First the death of the seed, then out of its cracked, open jaws is wrenched the victory of new life. Mocan and Hirst, both in their very different ways, testify to this asymmetry of life and death, but in the threefold Christian schema of creation—fall—redemption it is only Mocan who can tell us how the story ends. There is one more twist in the tale of the unexpected meeting of the journeys we are taken on by these two very different artists. In both Mocan’s Illseed and Hirst’s The Physical Impossibility of Death in the Mind of Someone Living, that which the work cannot present to us directly (namely life and death respectively) attends the work as a performance in its very fabric. It is well known that the carcass currently exhibited as The Physical Impossibility of Death in the Mind of Someone Living is not the original shark (which had its mouth closed), for the first specimen gradually dissolved in its formaldehyde solution and had to be replaced. The second shark (with mouth open) will before long, we may expect, go the same way. The shark itself is slowly fading away, such that what is presented to us is not death as such but a very slow process of decay. The work cannot present death to our living minds, but it can perform before our gaze a symbol of its slow, inexorable arrival. Life similarly attends Illseed. Mocan’s chosen material, carved and unlacquered makrocarpa wood, continues to breathe and interact with the elements, attracting bryophytes in its outdoor setting, as do the grasses conspicuously planted in the circle of stones at its base. As it is colonised by and plays host to the life which surrounds it, we see performed in natural slow motion the presence of life it is unable to present. Just as the frozen presentation of life in Mocan’s Illseed is subversively colonised by the living, so also is the Christian conviction that the Holy Spirit attends the written Word of God, convicting of its truth and bringing life in the name of the one its letters trace. Though the shark cannot present death to us, it is itself haunted by death. And though the monumental seed is not a living seed, life infiltrates Mocan’s sculpture. In both cases we pass through a bold, originary affirmation, past a realisation of the absence concealed by this first assertion, to arrive with Hirst at a double absence and with Mocan at a crescendo of hope. Mocan’s hope, to be sure, can take us beyond Hirst’s absence, supplementing the British artist’s rhythm of creation and fall with the gospel note of redemption. Nevertheless, it remains that both Hirst’s and Mocan’s works function as an invitation to different moments of existential contemplation, guiding us to a fresh apprehension of the death and life at which every day we look, but do not see. Damien Hirst: For the Love of God, 2007, platinum cast of an 18th-century human skull encrusted with 8,601 flawless diamonds, including a pear-shaped pink diamond located in the forehead that is known as the Skull Star Diamond, teeth. Liviu Mocan: Illseed, 2007, makrocarpa wood, height 7 m. Collection of North Shore Hospital, Auckland, New Zealand. John Ferguson, a sculptor based in New Zealand helped Liviu in the creation of Illseed. Photo: John Ferguson. 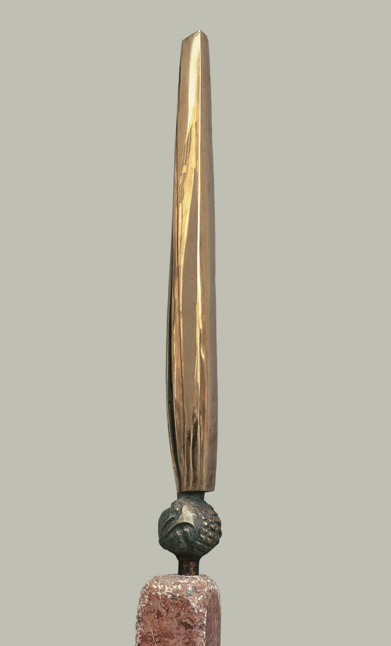 Liviu Mocan: Ascension, 1999, bronze and red marble of Moneasa, 157 x 16 x 16 cm. Collection of Dr. Graham W. Giles, UK. Photo: Radu Pop. Damien Hirst, b. Bristol 1965, studied at Goldsmiths' College 1986-1989. In 1988, while still at college, he curated the exhibition Freeze which has come to be seen as a landmark event in the development of Britart. During the 1990s he established himself as a leading figure in contemporary British art, gaining notoriety by the use of dead animals, such as butterflies, cows and sheep. He won theTurner Prize in 1995. He benefited early on from the substantial patronage of Charles Saatchi, and Hirst has gone on to become one of the most financially successful artists in the world. Liviu Mocan is a Romanian sculptor. He was born in 1955 in Cara village, Transilvania. He studied at the Art Academy in Cluj- Napoca, Romania, followed by post academic studies in the U.S. In 1995, under the atheist communist government of his country, he started to understand, love and follow Jesus Christ. Since that time he values the fact that he is a creation higher than the fact that he is a creator. Sculptures become for him his altar, his prayers, his tears, his joy, his spiritual exercises of understanding God, the world, beauty and himself. His main artistic preoccupation revolves around matters of resurrection in large series of work such Seeds, Pillars, and Vertical Libraries. ‘I am striving to polish mirrors for heaven,’ the artists says. Website: www.liviumocan.com. Christopher Watkin lectures French thought and culture at Monash University, Melbourne, Australia. He works in the area of contemporary French philosophy and his latest book, Difficult Atheism: Post-Theological Thinking in Alain Badiou, Jean-Luc Nancy and Quentin Meillassoux (Edinburgh University Press, 2011), considers the complex interface between religion and atheism in that field. He has also recently published From Plato to Postmodernism: The Story of Western Culture through Philosophy, Literature and Art (Bristol Classical Press, 2011). See www.christopherwatkin.com. Illseed, 2007.Ascension, 1999. The Physical Impossibility of Death in the Mind of Someone Living, 1991. For the Love of God, 2007. Damien Hirst and Gordon Burn, On the Way to Work (London: Faber and Faber, 2001), 19.ww.liviumocan.com/seeds.html. John 3:8. Romans 8:2. Enrico De Pascale, Death and Resurrection in Art (Los Angeles: Getty Publications, 2009) 108. John 12:24-25. 1 Corinthians 15:53-54 . John 1:18. John 6:68.